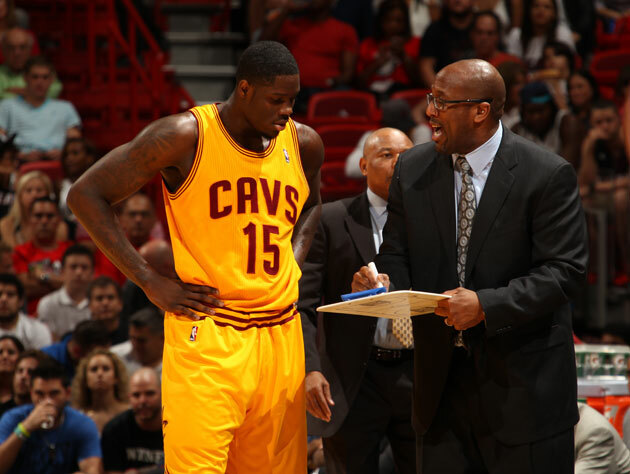 Should the Cleveland Cavaliers bite the bullet, and send Anthony Bennett to the D-League? Cleveland Cavaliers forward Anthony Bennett has improved slightly in December, shooting 44 percent from the field as he rounds into shape and away from a shoulder injury that was part of his slow start, but he’s still having a miserable season overall. The top overall pick in last June’s NBA draft is averaging just 7.8 points and 7.1 rebounds for every 36 minutes he plays, he launches well over half his shots from three-point range, and he’s shooting just under 28 percent overall. Everything seems aligned against Bennett at this point. He was the surprise top overall pick in a draft with no obvious go-to star, selected into a Cleveland frontcourt already featuring several big men. He’s been shoehorned into the small forward slot as a rookie, which makes absolutely no sense for someone with his bulk and length; because while he may have a good looking stroke from long range, that doesn’t mean he should be taking an Antoine Walker-like 7.6 three-pointers for every 36 minutes he plays. On top of that, the shoulder injury he suffered last spring both prevented him from playing in the NBA’s summer league, and from getting into NBA-level shape to start the season. Much less small forward-shape. And that goes for Bennett, too, who admittedly entered training camp out of shape after a summer spent not playing basketball while he recovered from shoulder surgery. "It's a huge transition from college to the pros," Ford said. "The game is so much faster. Even if you are in shape, it's a major learning curve. But when you come in like he did, there was just no way he could keep up. That’s one of the rubs, with Bennett. Should he have been the top overall pick? Probably not. Is it a problem that he was the top overall pick? Not in the slightest. Because while players taken after Bennett, like Victor Oladipo, Otto Porter or Ben McLemore all have intriguing talent, none of those guys really come off as a top overall pick. Even if they were setting the league on fire with their play, as they most certainly are not right now. Even the closest thing the 2013 NBA draft had to a top overall pick, former Kentucky center Nerlens Noel, is still recovering from a torn ACL, and may not play for the Philadelphia 76ers this season. Even if Noel were healthy come draft time he still may have been bounced out of the top five in most recent NBA drafts, and especially the boffo 2014 NBA draft. The best rookie in the NBA thus far as been the 76ers’ Michael Carter-Williams, and he was a huge “boom or bust” selection for Philadelphia. The lanky guard has been brilliant so far, even winning a Player of the Week award in his first week with the Sixers, but scouts seemed completely divided as to whether or not his intriguing batch of basketball gifts would find a home in the NBA. Teams shouldn’t be chastised for letting him slip to tenth overall in a terrible draft, because of his unique skill set. Bennett, in comparison, has an NBA-ready skill set. The burly forward showcased fantastic touch as a scorer and rebounder in UNLV, and in many ways seemed like one of the few sure things in the 2013 draft. This is likely why the Cavaliers selected him tops overall ahead of players with higher ceilings, knowing that at the very worst they could count on Bennett working out as a consistent NBA scorer, as opposed to a project pick that may or may not pan out. Instead, Bennett has turned into the project, having his confidence shot to bits by booing fans, and shoved into a small forward position in the pros that absolutely does not suit him. The shooting woes are Bennett’s fault, he needs to stop hanging around the perimeter so much, and he needs to exploit mismatches even at the small forward position. Everything else, though, is Cleveland’s fault. They saddled him at the wing because of the presence of Tristan Thompson. They saddled him with the first overall status. And they’re saddling him with inconsistent minutes and a possible waste of a rookie season. This is part of the reason why we agree with Ford, and why Bennett should be allowed to roam free in the D-League, working his way back up to game speed and building his confidence back. Making more than 30 percent of his shots. Actually playing a position that suits him. That sort of thing. The Cavaliers still have playoff hopes this season, but the team’s fan base has to be very, very worried about the direction of the franchise. The team lost LeBron James in 2010, and that was entirely on LeBron. It was entirely on the team’s ownership and front office, though, for their snooty response – both online and in deciding to head into 2010-11 without tearing the veteran team apart in order to accrue draft picks and assets. The team lucked into the top overall pick in 2011 by vaulting up nine spots in the lottery, after acquiring the massive contract of Baron Davis in a trade without any knowledge that the NBA would set up an amnesty program nine months later. Drafting Kyrie Irving first overall was a no-brainer, but selecting Thompson ahead of Jonas Valanciunas was criticized as much then as it was now. Dion Waiters hasn’t panned out next to Irving thus far, as the two have reportedly clashed, and Bennett is in real danger of having a Kwame Brown-level pox put over his head as his confidence dwindles. Brown didn’t have the D-League at his disposal in 2001, but Bennett does. Not to be cruel to Kwame, but Bennett has a better NBA-styled frame and more potential than Brown ever did. And with minutes hard to come by and the youngster’s status lessened game by game, the Cavaliers have to figure something out. Anthony Bennett has All-Star-level talent, and the current approach isn’t working. It’s time for the Cleveland Cavaliers to take the blinders off, and try something new.